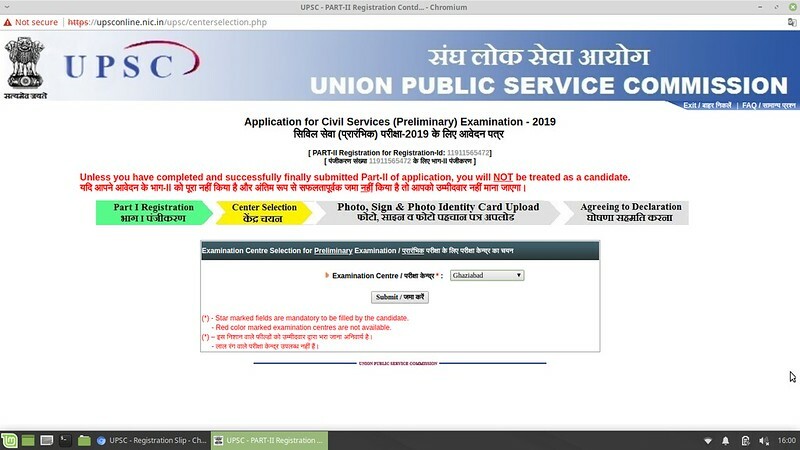 IFS Application Form 2019 – Union Public Service Commission (UPSC) has extended the time period to fill IFS 2019 Application Form, now candidates can do the registration until March 19, 2019. 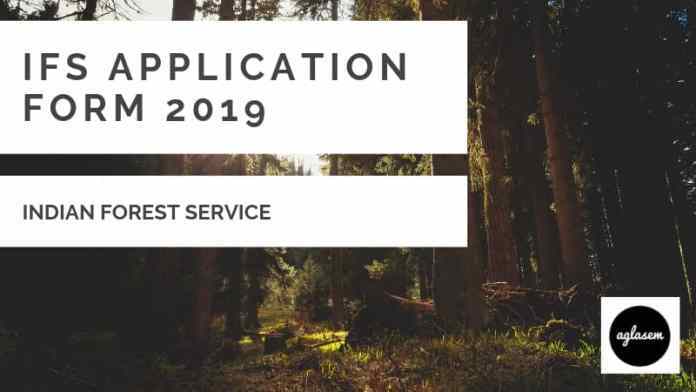 Application Form of IFS 2019 was released on February 19, 2019. The Online Form has been made available at the official website i.e. upsconline.nic.in. IFS 2019 registration process completes in 2 parts i.e. Part 1 Registration and Part 2 Registration. Up to March 18, 2019 candidates will be able to submit the IFS Application Form 2019. The general category candidates have to pay Rs 100/- as the examination fee and for SC, ST, BC, PH & Ex-Servicemen category candidates fee is Exempted. From this page, the candidates will get full information regarding IFS Application Form 2019. Latest: UPSC has extended the last date to fill IFS 2019 Application Form, now candidates can submit their form until March 19, 2019. 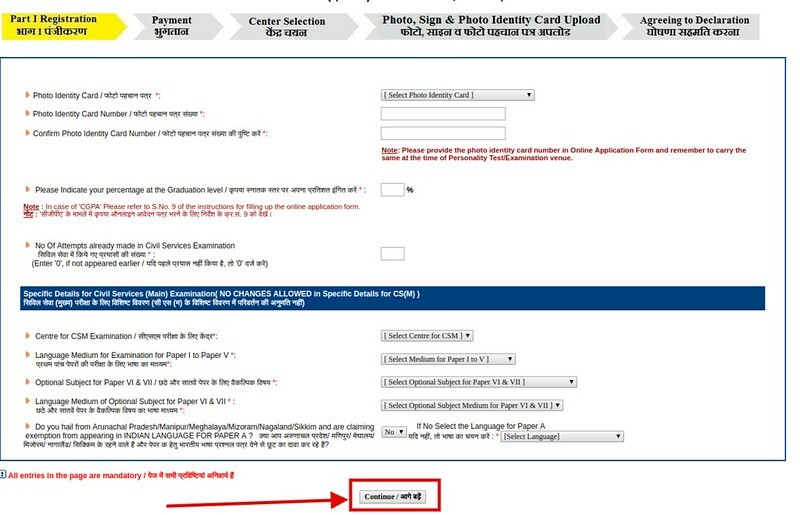 In the form, candidates are required to fill the valid details. The IFS 2019 recruitment will be done for approximately 90 vacancies. The candidates who will be shortlisted for appearing in the mains examination those will have to fill the Detailed Application Form (DAF) then only he/she will be called for appearing in the IFS Main Examination. For more details regarding IFS Application Form 2019 check the schedule given below. 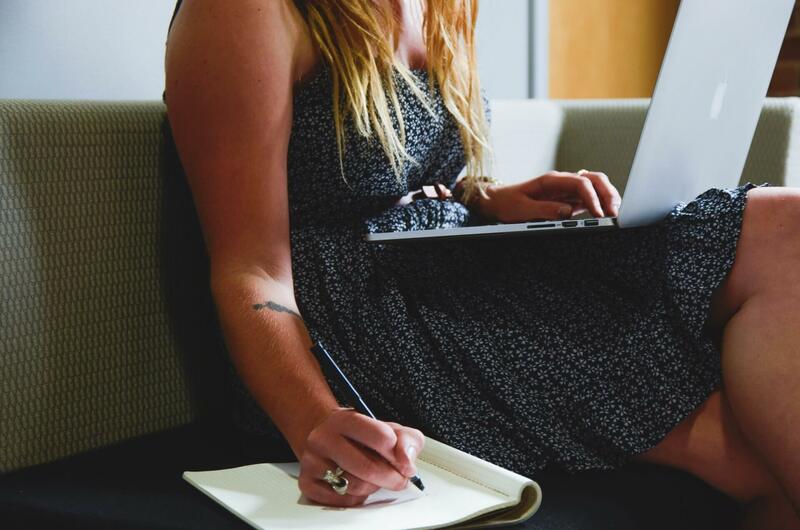 Apply Online – Click Here to fill the online IFS Application Form 2019. For the completion of the registration process candidates have to make the fee payment then only his/her for will be excepted. Candidates make the examination fee payment by using modes i.e. online and offline mode. From below candidates can see the IFS Application Fee 2019 details. The candidates belonging to General category those have to pay Rs 100/- as the examination fee. Candidates belonging to the SC, ST, BC, PH & Ex-Servicemen category for those application fees are Exempted. Payment Mode – There are two modes for making the IFS Application Fee 2019 Payment, check the details from below. Online Payment – Candidates can make fee payment by using Visa/Master/RuPay Credit/ Debit Card or by using net banking facility of State Bank of India. Offline Payment – Candidates can do the payment by depositing the money in form of cash at any branch of SBI. Before filling the form candidates should first collect the documents which will be needed at the time of the filling the form this will help the candidates for doing the error-free registration. From below candidates can check the documents which will be required for filling the IFS Application Form 2019. Scanned photograph and signature in jpg format. The Scanned Photograph and Signature should not more than 300 KB and must not be less than 20 KB in size. How To Fill IFS Application Form 2019? Candidates can follow the steps given below for filling the IFS Application Form 2019. While filling the form candidates should take the reference of the above-provided documents then only you will be able to fill up the form correctly. Registration process completes in 2 parts i.e. Part 1 Registration and Part 2 Registration. 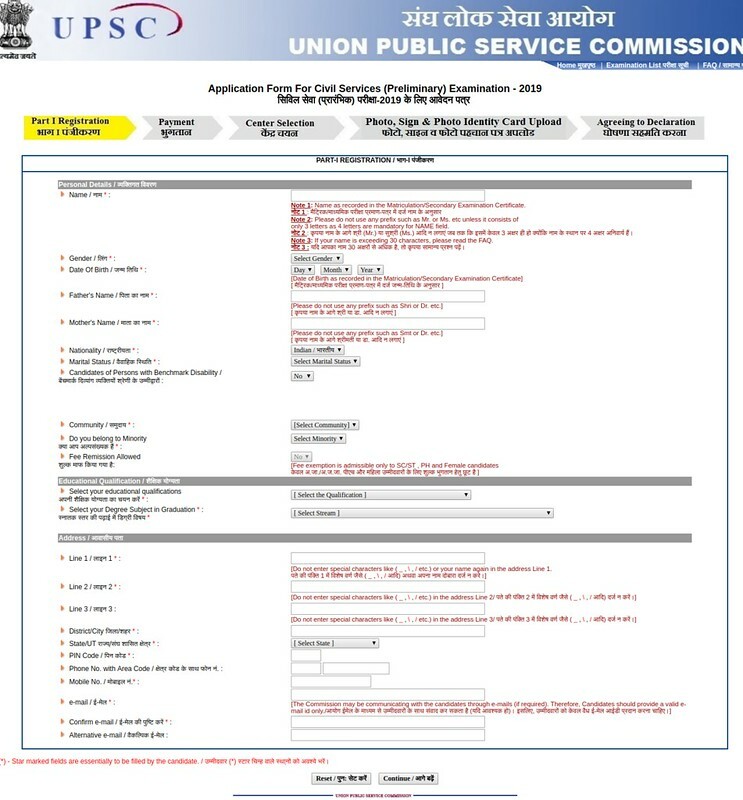 Thereafter, UPSC Apply Online Page will open, same as shown in the image below. From the UPSC Apply Online Page click at the link which says “Click Here for Part I”. Thereafter, the Application Form Filling Instruction page will appear. Read all the given Instruction then after that click at the “Yes” button. On clicking at the Yes button Part 1 Registration Page will open. Part 1 Registration Process is completed. In the part 1 registration page candidates need to fill the Personal, Educational/ Qualification, Address details. After filling all the details recheck it and then click at the Continue button. On Submitting the form the candidates will have the next option to choose whether they want relaxation in upper age limit or not. On clicking at the continue button Photo, Sign & Photo Identity Card Upload page will open. In this page, candidates need to upload the signature and photo and need to mention the identity card no. and mention the mains examination details such as Main examination center, language Medium for Paper I to V, Optional subject VI to VII, Select language for Paper A. After filling details click at the continue button. 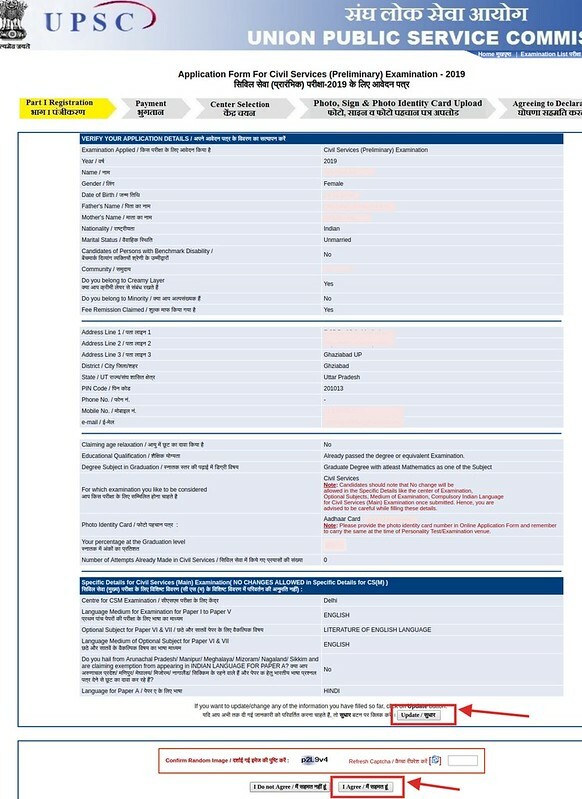 Thereafter, the Confirmation form page will open as shown in the below image. Here the candidates have the option to update their form. After this, they can’t edit their form. After reading all the details click at the I Agree button. Thereafter registration slip will be generated. Note: The candidates should note that they should take the print out of the registration slip for future reference. Payment: In the payment page candidates need to fill the name, account no. etc. Candidates can also choose the payment mode. After filling the payment details page click at the continue button. Center Selection: On clicking at the continue button center selection page will open. In this page candidates have selected the examination center of prelims exam. After filling the exam center click at the submit button. Step 3 Photo Sign & Photo identity card: In this section, the candidates ahve to upload the photograph signature and document of identity. Step 4 Agreeing to the Declaration: At last, the candidates have to agree with the declaration. UPSC will release the separate admit card for each stage of the examination. The admit card will be released at the official website. At first, admit card for the preliminary examination will be released. Admit Card is the key to enter in the examination hall. Admit Card will contain the name of the candidate, father’s name, examination name, center code, exam duration, gender, photograph, signature etc. On the day of the examination for all the candidates, it will be mandatory to carry a hard copy of the admit card and one valid id proof (aadhar card, pan card, driving license, passport, voter id card etc). Union Public Service Commission (UPSC) conducts the Indian Forest Service Examination (IFS). The candidates’ selection will be done on the basis of three stages that are Prelims, Mains and Interview Test. Each stage of IFS is qualifying in nature. The candidates who will be finally selected those will be appointed in the Forest Service Department. The selection of the candidates is purely based on the performance of the candidates. This year recruitment will be done for approximately 90 vacancies.